of the robbery that goes on in all civilised countries that inevitably our armies must come to clash together. On that and on other grounds, I consider capitalism the most infamous, bloody and evil system that mankind has ever witnessed. My language is regarded as extravagant language, but the events of the past four years have proved my contention. [The Lord Advocate] accused me of my motives. My motives are clean. My motives are genuine. If my motives were not clean and genuine, would I have made my statements while these shorthand reporters were present? I am out for the benefit of society, not for any individual human being, but I realise this that justice and freedom can only be obtained when society is placed on a sound economic basis. That sound economic basis is wanting today, and hence the bloodshed we are having. I have not tried to get young men particularly. The young men came to my meetings as well as the old men. I know quite well that in the reconstruction of society, the class interest of those who are on the top will resist the change, and the only factor in society that can make for a clean sweep in society is the working class. Hence the class war. The whole history of society has proved that society moves forward as a consequence of an underclass overcoming the resistance of a class on top of them. So much for that. I also wish to point out to you this, that when the late King Edward VII died, I took as the subject of one of my lectures ‘Edward the Peacemaker’. I pointed out at the time that his Entente Cordiale with France, and his alliance with Russia, were for the purpose of encircling Germany as a result of the coming friction between Germany and this country because of commercial rivalry. I then denounced that title ‘Edward the Peacemaker,’ and said that it should be ‘Edward the War-Maker’. The events which have ensued prove my contention right up to the hilt. I am only proceeding along the lines upon which I have proceeded for many years. I have pointed out at my economics classes that, owing to the surplus created by the workers, it was necessary to create a market outside of this country, because of the inability of the workers to purchase the wealth they create. You must have markets abroad, and in order to have these markets you must have empire. I have also pointed out that the capitalist development of Germany since the Franco-Prussian War has forced upon that country the necessity for empire as well as this country – and in its search for empire there must be a clash between these two countries. I have been teaching that and what I have taught is coming perfectly true. I wish no harm to any human being, but I, as one man, am going to exercise my freedom of speech. No human being on the face of the earth, no government is going to take from me my right to speak, my right to protest against wrong, my right to do everything that is for the benefit of mankind. I am not here, then, as the accused; I am here as the accuser, of capitalism dripping with blood from head to foot. In connection with the ‘ca’canny’ at Parkhead Forge, I wish to take up some particular points first of all before I deal with the revolution. It is quite evident that it was in connection with a report in the Forward [newspaper] that reference was made to David Kirkwood. It was there reported that Kirkwood had made a record output. Now David Kirkwood, representing the Parkhead Forge workers, at the end of 1915, when the dilution of labour began, put forward a printed statement for the benefit of Mr Lloyd George and his colleagues, the first sentence of which in big type was – ‘What you wish is greater output’. He said that the Parkhead Forge workers were then prepared to give a greater output and accept dilution if they, the workers, had some control over the conditions under which the greater output would accrue. That was his contention. Since he has got into position he seems to have boasted that he has got a record output. The question was put to me: was this consistent with the position and with the attitude of the working class? I said it was not consistent with the attitude and the position of the working class, that his business was to get back right down to the normal, to ‘ca’ canny’ so far as the general output was concerned. The country has been exploited by the capitalists in every sphere, to get the toilers to work harder to bring victory. I said at the commencement of the war that while this was being done, and while assurances were being given that at the end of the war the people would get back to normal, I said that circumstances would make such a return impossible. Now I have ample evidence to support that belief – I have used it at my meetings at Weir’s of Cathcart – that they were asking the workers to toil harder not only during the war, but after war, [that] they wish them to work harder and harder because there is going to be ‘the war after the war’ – the economic war which brought on this war. You see therefore the workers are brought into a position where they are speeded up, and they are never allowed to go back again. They are speeded up again and again. What is the position of the worker? This country is not a free country. The worker is deprived of land or access to the land; he is deprived of workshops or access to the materials and tools of production; the worker has only one thing to do in the market, and that is to sell his labour power. The capitalist purchases that labour power, and when he gets the worker inside the workshop, his business is to extract as much of that labour out of him as possible. On the other hand, when it comes to wages, then the employer applies the principle of ‘ca’canny’. ‘Ca’canny’ is quite justifiable when it comes to the employer giving wages to the workers, and we have seen it since the commencement of the war. Prices rose right away from the commencement of the war while the workers’ wages were kept at the old normal. Their wages were kept low. The purchasing power of the workers’ wages was therefore diminished. They were therefore robbed to that extent. At the same time the workers were asked in the name of the country to work harder, ‘but’, said the employers, ‘we will not give you any more money, although the money you are getting is purchasing less in the way of food, etc’. That is the position. What is right for the one is equally right for the other, although the interests of the two classes are diametrically opposed. That is the position, and in view of that fact that many of the workers have overworked themselves and have had to lie off through overstrain and considering the treatment they get when thrown out on the scrapheap – kicked out like dogs when they are no longer useful – they are compelled to look after their own welfare. The worker has therefore in the past adopted the policy of ‘ca’canny’, and I have in the interests of the working class advocated the policy of ‘ca’canny’, not because I am against the war, but, knowing that after the war the worker will have the new conditions imposed upon him, I hold still to the principle of ‘ca’canny’. I accede to that. So far as Parkhead Forge is concerned, I also pointed out that none of the great big guns had been made for some time prior to the great offensive. When the offensive came, Gough, the friend of Sir Edward Carson, the man who before the war was going to cut down the Irishmen, he retreated and lost so many guns, and then the Glasgow workers had to give over their Easter holiday in order to make those guns. We have, therefore, Beardmore and others responsible for shortage of certain material, and we know from further disclosures that millions of shells have been useless, and perhaps that has been due to the fact of over-speeding, so that even over-speeding may do nothing for the advancement of the war. Furthermore, if big reserves of material are going to be built up, and the Germans are to be allowed to get them, that is going to be to the advantage of the Germans, and not to the advantage of the British. With regard to the next point, ‘down tools’, so far as Glasgow is concerned, I do not think I told the workers to ‘down tools’. I am of the opinion that I said: ‘Now you are determined to “down tools”, it is of no use standing idle; you must do something for yourselves.’ As a matter of fact my statement was based on a resolution that had been passed by the ASE [Amalgamated Society of Engineers] in the Clyde area, the official Engineers’ Committee. It met and it determined to down tools against the introduction of the Man Power Bill. At the same time that was supplemented by official effort at [Auckland] Geddes’s meeting in the City Hall. There a resolution was put up by the workers and carried virtually unanimously, that if the Man Power Bill was put into operation, the Clyde district workers would ‘down tools’. It was unnecessary for me, therefore, in light of these official and unofficial statements, to urge the ‘down tools’ policy. Now then, food and farms. I pointed out to the workers that what was necessary if they stopped work was the getting of food. There had been a shortage; the Government had held up the supplies, for several reasons probably – perhaps to get this rationing passed, in order to have a tight hold on food, and also lest the people get out of hand in reference to this Man Power Bill. I knew that there was plenty of food in stores in Glasgow, and that the farmers had food stored up in their farms. The farmers have used the war in order to make huge profit for themselves, and then the Government assisted them in connection with the potato regulations; and latterly, in the last year, the Corn Production Act was passed, not in the interests of the farm labourers, but in the interests of the farmers. When the demand for more food production was made, the farmers said they would do their best, and the government refused to give the farm labourers a minimum wage of twenty-five to thirty shillings a week – twenty-five shillings at that time being equivalent to ten shillings in normal times. The farmers were going to get extra as a consequence of the Corn Production Act. I therefore pointed out that if the workers went to the farmers and did not get the food stored up in the farms, they should burn the farms. We as socialists have no interest in destroying any property. We want property to be kept because we want that property to be used for housing accommodation or other reasons, but I specially emphasised about the farmers for the purpose of drawing attention to this particular point. In the same way, when it came to the question of seizing the press, I suggested that when the Daily Record was seized, the plant should be broken up. I did not say that in connection with the Glasgow Herald. I said so in connection with the Record, not that it is a good thing to break up printing plant, but in order to draw attention to the Harmsworth family and to the Rothermeres and so on, and their vile press, which seems to be an index of the culture of Britain. I mention that particularly here, that I said the Record plant should be broken up, in order to emphasise the disgust of the organised workers with regard to that particular family of newspapers. So far as Ireland and America are concerned, that was mentioned particularly for the purpose of getting food from the St Lawrence [waterway in north America], food from the United States, and food from Argentina. What was needed was food in order to hold our own, for, as the Glasgow Herald pointed out, when the Bolsheviks first came into power, Britain was withholding food from Russia, in the expectation that frost and famine would overthrow the Bolsheviks. That is to say, they were anxious to murder women and children inside Russia, as well as men. The suggestion I made was in order to draw the attention of the workers to the need of having plenty of food stuffs to keep them going. So far as the Government’s responsibility for the murder of women and children is concerned, the reason for my statement is perfectly obvious. They have been accusing the Germans of killing women and children in this country. Perfectly true. Of course bombs dropped in Germany have not killed women and children, marvellous to say! But that apart, we had the government getting hold of the food supplies immediately prior to, and immediately after the New Year, and creating a shortage. I pointed out that it was an artificial shortage. The government was therefore responsible for the queues. Women were standing in queues in the cold, and women had died of what they had contracted during their standing in the queues. The women had died therefore in consequence of the action of the Government, and I threw the responsibility upon the government – and I do so still. We know that women and children – human material – have been used up inside the factories, and the housing of the working class in this country has been so bad, and is so bad to-day, that the women and children of the working class die in greater proportion than the women and children of the better-to-do classes. I have always pointed out that the death rate among the working classes has always exceeded that in the better-to-do districts. I also pointed out that the British government had sent Russian subjects back to Russia to fight, and had given their wives twelve shillings and sixpence a week and two and sixpence for each child. Now when I was functioning as Russian consul, two deputations of Russian women came to me and they told me sorrowful tales of depression, disease, and death in consequence of the fact that they had received twelve and sixpence a week and two and six for each child. I wrote to the Secretary for Scotland in regard to that and I received no reply. The children ought not to suffer because their fathers have been taken, but those children have suffered. There is not a Lithuanian family in the West of Scotland but has trouble today as a consequence of the starving of these people. These women and children of the Russian community have died as a consequence of the meagre supplies given to them by the British government, and I seize this opportunity for the purpose of making my statement public, in connection with these women, in the hope that the public in general will press the government to see that these women and children are attended to at least on the same scale as the wives and dependants of British soldiers. With regard to the Yankees, I said, and I say to-day, that the Yankees are out for themselves. The British press – the British capitalist press – sneered and jeered at the Americans before the Americans came in, and pointed out how the Americans were making piles of profit out of the war, but were not participating in this fight for so-called freedom. Those insults were offered to America, and when Mr Woodrow Wilson said that America was too proud to fight, then that was used venomously. Therefore, if I erred, I erred on the same side as the capitalist class of this country. I made the statement on American authority, not off my own bat. My authority is Professor Roland G. Usher, Professor of History at Washington University. I think his statement in Pan-Germanism is one of the finest, showing the moves throughout the world leading up to this war, and Usher has his bias in favour of Britain. What I wish to particularly refer to are his two books Pan-Germanism and The Challenge of the Future. In Pan-Germanism, he surveys North and South and Central America. He takes the Atlantic first, and explains what will be the consequence of the war as regards South and Central America whichever side wins, and then he takes the Pacific. He works it out from a material and economic point of view, his purpose being to get Central and South America to work in with the United States. In his later book he modifies that position – that is to say in The Challenge of the Future. He points out that America is still today economically dependent, that is to say, she has got to pay interest to financiers in France, in Britain, and therefore America cannot afford to carry out the bold schemes referred to in his book, Pan-Germanism. I may now state that today the business men of this country know perfectly well that the Yankees are boasting of their independence. Therefore when you see references to American independence, that means that she no longer needs to pay interest to investors from outside, and that her policy wil be modified in consequence of that new phase. This gentleman points out that as a consequence of American dependence she must say which side she will take. This book was printed prior to America entering the war. Woodrow Wilson’s policy works in admirably with the suggestions in that book of Professor Usher, The Challenge of the Future. We know quite well too that the United States of America prevented Japan in 1915 getting economic and political control over North China. Twenty-one articles were imposed on China after the Japanese had released their grip of the Germans there. America, alive to her own interests, getting to know of these twenty-one points, forced Japan to withdraw. America was there working in her own interests. Japan has been, I think, incited to land at Vladivostok in consequence of the Russian Revolution, and in order to crush the Bolsheviks. The allies on both sides are united to crush the Bolsheviks. America did not take that course. America, early on, began to back up the Bolsheviks because America was afraid that if Japan got half Siberian Russia that would give her a strategic control of Siberia, and it would mean a closed door to American contact across the Pacific with Russia proper. America therefore has been looking to her own interests, and for that reason I contend that the Yankees, who have been the worshippers of the mighty dollar, are looking after their own interests in the present war; and as to the great boast they have been making about what they are going to do, and their inadequate returns – that, I think, shows that America has not been over-anxious to plunge right away into this war and make all the sacrifices she has said. I know, of course, that America has had her own troubles at home, racial troubles, and also troubles with the workers. Numerous strikes have taken place in America since the commencement of the war, not only in consequence of the war, but also in connection with the economic position. lower my temperature. I was aware of what was taking place in Peterhead from hints and statements by other prisoners there; that from January to March, the so-called winter period, the doctor is busy getting the people into the hospital, there breaking up their organs and their systems. I call that period the eye-squinting period, because the treatment then given puts the eyes out of view. Through numerous expedients I was able to hold my own. I saw these men round about me in a horrible plight. I have stated in public since that I would rather be immediately put to death than condemned to a life sentence in Peterhead. Attacks were made upon the organs of these men and also upon their nervous system, and we know from the conscientious objectors that the government have taken their percentage of these men – some have died, some have committed suicide, others have been knocked off their heads, and in this way got into asylums. The very same process has gone on there. Mrs Hobhouse has done a good service to mankind in registering the facts, but, unfortunately for Mrs Hobhouse, she does not know how the result has been obtained. I experienced part of the process; and I wish to emphasise the fact that this callous and cold system of destroying people is going on inside the prisons now. Whatever is done to me now, I give notice that I take no food inside your prisons, absolutely no food; because of the treatment that was meted out to me. If food is forced upon me, and if I am forcibly fed, then my friends have got to bear in mind that if any evil happens to me, I am not responsible for the consequences, but the British government [is]. 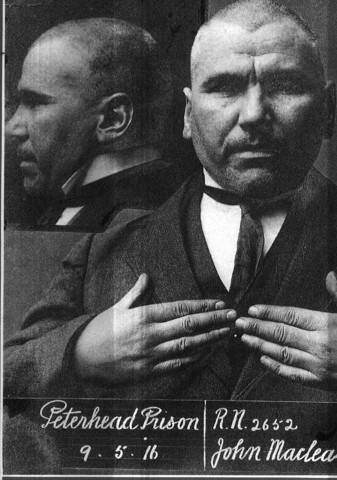 If anything had happened to me when I was last in prison, it would have been attributed to John Maclean, not to those who are working in the interests of the Government. I have been able to lay down my principle and policy, not from mere internal and personal experience, but from objective experience. I studied the matter carefully, I combated the evils that were going to be perpetrated by the government by reducing my food to the minimum, and the present Secretary for Scotland knows that when I was in Perth I wrote to him asking for more food because of my reduced weight. I was about eight stones in weight at the time, and the doctor, after weighing me, had to grant me more food. The food, however, was of no use to me. I threw it into the pot. My position is, therefore, that I take no more government food, that I will not allow any food to be forced in upon me, and if any food is forced in upon me I am not responsible for it, but when the government can launch millions of men into the field of battle, then perhaps the mere disposal of one man is a mere bagatelle and a trifle. So far as Russian freedom and British slavery are concerned, I wish to draw attention to the fact that an article appeared in the Scotsman the other day about Bolshevism, and I have a feeling that the article was written especially for this trial to create a feeling against Bolshevism. The statements in that article are a travesty. Inside Russia, since Lenin and Trotsky and the Bolsheviks came into power, there have been fewer deaths than for the same period under any tsar for three hundred years. Capitalists have been killed perhaps, officers have been killed perhaps, because they have not submitted to those who have come to the top – the majority of the people – in the name of Bolshevism. Some may have been put to death. When there was a shortage and disorganisation of the food supplies before the Bolsheviks came into power, there may have been individuals who, in their scramble for food for themselves, have gone to excess, but the crimes of individuals cannot be charged to governments. No person would hold the government responsible for the action of those individuals. The Bolshevik government has not given orders to kill men. They have to imprison men until a complete reconstruction of society has come about. It may be news to some of you that the co-operative movement in Russia has grown more rapidly than in any other part of the world, and since the Bolsheviks have come into power, co-operation has been growing more and more rapidly. The universities have been used during the day, and in the evenings, to train the working classes in order that they may manage the affairs of their country in an intelligent manner. The schools have also been used in the evenings, the music halls have been used, and the theatres, and the picture houses, all have been used, not for the trivial trash which is given to the people of this country – but all for the purpose of organising the production of food and the work inside the workshops and factories. We saw that prior to our comrades in Russia signing their treaty, when the Germans made their advance into Estonia, Lithuania, and so on – the border countries between Germany and Russia – the capitalist class in the respective towns had lists of men who were members of the soviets, and those members of the soviets were taken and put against a wall, and shot at the instigation of the propertied class of Russia. They have been responsible for more deaths than the soviets. Our Finnish comrades, the Red Guards, have pointed out that the ordinary procedure of war has not been acceded to them, that as soon as the White Guards, the capitalist class, take any of them prisoner, they immediately put them to death. It has been said that our comrades over there in Russia were working hand in hand with the Germans, and the proof of this was that the Germans allowed Lenin to pass through Austrian territory. Our comrades have stood up against Germany as best they could, and the capitalists – the so-called patriots of Russia – have been working hand-in-hand with Germany in order to crush the people of Russia. That has been done in the Ukraine. It has been done in the various states stolen by Germany from Russia. Towards the end of December there was a pause in the negotiations for ten days, in order to allow the British and their Allies to go to Brest Litovsk. An opportunity, therefore, was given to Great Britain to go to Brest Litovsk. Ten days were given. The last day was 4 January of this year. Great Britain paid no attention to this opportunity, but on 5 January Lloyd George, in one of his insidious speeches, seemed to climb down as it were. He was followed by Mr Woodrow Wilson. But a speech by Mr Lloyd George on the 5th was of no use. It was mere talk. It was mere camouflage, or, a better word still, bluff, pure bluff. Why did the government not accept the opportunity and go to Brest-Litovsk? If conditions absolutely favourable to Germany were proposed, then Britain could have stopped the negotiations and plunged once more into the war, and – I am confident of this – if Germany had not toed the line and come up square so far as peace negotiations were concerned, that the Russian workers would have taken the side of Britain, and – I am confident of this – that that the socialists in all the Allied countries would have backed up their governments in order to absolutely crush Germany, and we would at the same time have appealed to the socialists of Germany to overthrow their government. Great Britain did not do so. On the other hand, they came on with their Man Power Bill, and also with their factor of short food. All these things must be considered in their ensemble before you can understand the position taken up by myself. When this universal peace meeting was held at Brest Litovsk, then Trotsky played a very, very bold game. He knew the risks he ran. He and the Bolsheviks spread millions of leaflets amongst the workers of Germany in the trenches – the German soldiers – urging them to stop fighting and to overthrow the Kaiser, the Junkers, and the capitalist classes of Germany. They made a bold bid by trying to get the German workers on to their side. Great Britain has been doing the very same since the commencement of the war. Great Britain has been trying to bring about, and hoping and urging for a revolution in Germany, in the hope that the working class would overthrow the autocratic class there and give us peace. Strikes broke forth in Italy. The strikes in January passed into Germany, more menacing strikes than have taken place inside the British Isles. An appeal was made from comrades to comrades. Many soldiers in Germany mutinied; many sailors of Germany mutinied, and these men are being shot down by their government. All hail to those working men of Germany who refused, at the bidding of the capitalist, to go on with this war. Their names will go down bright and shining where those of the capitalist of today and of the past will have been forgotten. It would be a very bad thing for the workers of the world if a revolution were developed and carried through to success in Germany, and no similar efforts were made in this country. The German workers’ enemy is the same as our enemy in this country – the landlords and the capitalists are our mutual enemy – and if it was their business and their right and their duty to overthrow their autocratic government, then it will be a duty on us not to allow these men to overthrow their Government, and then to allow France, Britain and Italy to march over them and make these German workers slaves at the dictates of the capitalists of the other parts of the world. There was the situation from their point of view and from our point of view, too. It has been pointed out that if we developed a revolution the German would come over and, instead of having liberty, we would be under the iron heel of the Kaiser. If I grant that that is true, it is equally true in the other case that the Allies would do in Germany what the German Kaiser with the capitalist class of Germany would do in this country. There can only be a revolution, when the workers of all the countries stand united and capitalism is crushed, and until then the war must go on incessantly and incessantly. It is not because I am against my own people. My own people are the workers here, and the workers in Germany and elsewhere. It was not the workers who instigated the war. The workers have no economic interest to serve as a consequence of the war, and because of that, it is my appeal to my class that makes me a patriot so far as my class is concerned, and when I stand true to my class, the working class, in which I was born, it is because my people were swept out of the Highlands, and it was only because of my own ability that I remained. I have remained true to my class, the working class, and whatever I do I think I am doing in the interests of my class of my country. I am no traitor to my country. I stand loyal to my country because I stand loyal to the class which creates the wealth throughout the whole of the world. We are out for life and all that life can give us. I therefore took what action I did in the light of what was transpiring inside Russia, inside Austria, and inside Germany. You have got to bear that in mind when you wish to understand my remarks. I therefore urged the workers in this country that if they were going to strike, mere striking was useless, because they would be starved back into work again, and that if they were going to be against the Man Power Bill, it meant that they were out for peace. And as there were no signs on either side of coming to an amicable constitutional conclusion, then it was the business of the workers to take the whole matter in hand themselves. individual, they do so under the Defence of the Realm Act. The government have power to do anything they desire. That may be right, or it may be wrong, but the position is this, that the bringing in of the Defence of the Realm Act has thrown aside all law and order as we know it during normal periods. In the plunge into the war we have the abolition of constitutional methods, and therefore I contended, and I contend to-day, that if it is right and proper on the part of the government to throw aside law and order – constitutional methods – and to adopt methods that mankind has never seen before, then it is equally right that the members of the working class, if the war is not going to cease in a reasonable time, should bring about a reasonable settlement, and a reasonable settlement to the workers is no victory to either side. If one side or the other wins, then the revenge will come, as France today is selling revenge after the drubbing she got in 1871. Realising that, we, as representatives of the workers of the world, do not wish one side or the other to be the victors. We wish the status quo prior to the war to be re-established. If the workers are going to do that, then it means that they have to adopt methods and tactics entirely different from the methods which would be adopted, or could be adopted under normal circumstances. Abnormal lines of action must be taken, and I urged abnormal lines of action to be taken, as our comrades in Russia took. The very circumstances of the war forced in upon the Russian workers’ committees, and their national soviets the line of the action which they adopted, and the only way we could do it would be to adopt methods peculiar to the working class organisation in this country in the interests of the workers themselves. The suggestions I made were intended only to develop revolutionary thought inside the minds of the workers. I pointed out at the meeting on the 20th that representatives of the police were present, and therefore if the workers were going to take action themselves, it would be absolutely foolish and stupid for them to adopt the suggestions I had given them. I only gave out these suggestions so that they might work out plans of their own if they thought fit to take action to bring about peace. I was convinced, and I am still convinced, that the working class, if they are going to take action, must not only go for peace but for revolution. I pointed out to the workers that, in order to solve the problems of capitalism, they would have to get the land and the means of production. I pointed out to them that if capitalism lasted after the war, with the growing size of the trusts, with the great aggregations that were taking place, with the improved machinery inside the works, with the improved methods of speeding up the workers, with the development of research and experiment, that we were going to have the workers turning out three, four and five times as much wealth as they had done in the pre-war times, and a great problem would arise – a greater problem than ever before – would arise before this country of disposing of its surplus goods on the markets of the world, not only of getting markets for these surplus goods, but of getting the raw materials. We see today in the committees appointed by the government that they are anxious to get control of the markets of the world in order to exclude the Germans. Our government has already appointed a Land Organisation of the Board of Trade and of the Foreign Office whereby it is going to plant agents here and there throughout the world, so that in a scientific method British products may be thrown on to the markets of the world. This is scientific methods, applied to commerce internationally as well as nationally. These preparations are being made, it is being said, for the purpose of carrying on the war after the war. Nobody denies that there is going to be a war after the war, an economic war between the Germans and her friends, and the British and the Americans and their friends, and there is going to be a war between the nations, and the respective governments will take care that, as far as they can, their capital will be planted in areas over which they have control. We see Japan also on the outlook. Japan has been trying repeatedly to get control of northern China. She would also like to get a great big chunk of Siberia. Even today we see the tentacles being sent out, all anxious to grab more and more power. We know the secret treaties and disclosures made by our Bolshevik comrades. We know that these nations have been building up their plans so that when the Germans have been crushed they will get this territory, or that territory. They are all out for Empire. That was absolutely necessary for the commercial prosperity of the nations. All the property destroyed during the war will be replaced. In the next five years there is going to be a great world trade depression and the respective governments, to stave off trouble, must rush more and more into the markets of the world to get rid of their produce, and in fifteen years’ time from the close of this war – I have pointed this out at all my meetings – we are into the next war if capitalism lasts; we cannot escape it. Britain had the wealth. Britain did everything she could to hold back the war. That necessarily had to be the attitude of Great Britain, but in spite of all Great Britain’s skill or cunning, there has been war. I have heard it said that the Western civilisations are destroying themselves as the Eastern civilisations destroyed themselves. In fifteen years’ time we may have the first great war breaking out in the Pacific-America [against] Japan, or even Japan and China [against] America. We have then the possibilities of another war, far greater and far more serious in its consequences than the present war. I have pointed that out to my audiences. I have taken up unconstitutional action at this time because of the abnormal circumstances, and because precedent has been given by the British government. I am a socialist, and have been fighting and will fight for an absolute reconstruction of society for the benefit of all. I am proud of my conduct. I have squared my conduct with my intellect, and if everyone had done so this war would not have taken place. I act square and clean for my principles. I have nothing to retract. I have nothing to be ashamed of. Your class position is against my class position. There are two classes of morality. There is the working class morality and there is the capitalist class morality. There is this antagonism as there is the antagonism between Germany and Britain. A victory for Germany is a defeat for Britain; a victory for Britain is a defeat for Germany. And it is exactly the same so far as our classes are concerned. What is moral for the one class is absolutely immoral for the other, and vice versa. No matter what your accusations against me may be; no matter what reservations you keep at the back of your head, my appeal is to the working class. I appeal exclusively to them because they and they only can bring about the time when the whole world will be in one brotherhood, on a sound economic foundation. That, and that alone, can be the means of bringing about a reorganisation of society. That can only be obtained when the people of the world get the world, and retain the world. Edward VII (1841-1910), king from 1901, liked to be known as ‘the Peacemaker’ and to exaggerate his role in bringing about the Anglo-French entente, known as the Entente Cordiale. This accord, which can be dated back to the 1840s, was renewed in 1904, following the King’s ceremonial visit to Paris in 1903. It was part of the system of international rivalries which culminated in World War I. ‘Ca’canny’ (call canny, get people to be cautious) is a Scots expression for restricting output, or adopting a policy of taking it easy. David Kirkwood (1872-1955) was the leading shop steward at Beardmore’s Parkhead Forge in the east end of Glasgow. A key figure in the CWC, he was seen by some as being under the influence of the Catholic socialist, John Wheatley, and susceptible to compromises with the employers that divided and weakened the CWC. He was one of those deported from Glasgow in March 1916. When re-arrested in 1917, after breaking the conditions on which he had been allowed to attend the Labour Party conference, he spent some time as one of the last prisoners ever to be held in the military surroundings of Edinburgh Castle. On his return to Glasgow, he was increasingly open in his support for maximising war production. In 1951, he was elevated to the peerage as first Baron Kirkwood of Bearsden. The reformist left-wing weekly, the Forward, had been founded in 1906 by the Independent Labour Party member Tom Johnston. It achieved a great boost to its popularity and circulation through being suppressed by the government for a month at the beginning of 1916 for reporting a meeting at which the audience gave the then Munitions Minister, David Lloyd George, a torrid reception. Johnston served as Secretary of State for Scotland in Churchill’s World War II coalition, and later was Chancellor of Aberdeen University. Weir’s of Cathcart, like Parkhead Forge, was one of the munitions works where the CWC had influence. Jim Messer, secretary to the CWC, worked there. William Weir (1877-1959) had been director since 1902 and managing director since 1912, of the company built by his father. He was determined to break the resistance of the workers, and of some cautious spirits amongst his fellow-employers, in order to increase production by breaking down craft restrictions. He was appointed Director of Munitions for Scotland in 1915 and knighted two years later. 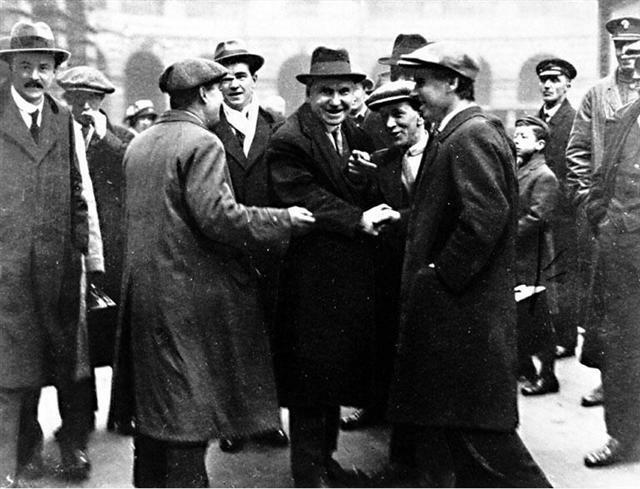 The Amalgamated Society of Engineers, and other unions, had in part justified their concessions to the employers and the government over working practices, with the assurance that the government had guaranteed the restoration of pre-war practices after the war. Workers were justly sceptical about the likelihood of this happening. General Sir Hubert de la Poer Gough, GCB, GCMG, KCVO (1870-1963), a senior officer in World War I, was a favourite of British Commander-in-Chief, Sir Douglas Haig, and commanded the Fifth Army, 1916-1918. Edward Carson (1854-1935), a Dublin-born lawyer, had in the early 1890s destroyed his former university friend, Oscar Wilde, when he defended the Marquis of Queensbury in Wilde’s ill-fated libel action. In the pre-war years Carson played a key role in establishing the Ulster Volunteer Force, running guns to Ulster protestants fighting Irish nationalism. He was Attorney General in the first wartime coalition, formed by Prime Minister H. H. Asquith in 1915, and, a year later, was made First Lord of the Admiralty by Asquith’s successor, Lloyd George. Auckland Geddes was Director of Recruiting for the War Office (1916-17) and Minister of National Service (1917-19). See Introduction, note 13. The Corn Production Act of April 1917 guaranteed prices to farmers and a minimum wage to agricultural workers, in an attempt to boost food production. It also increased the interventionist powers of the Board of Agriculture. Alfred Harmsworth (1865-1922), Viscount Northcliffe, was owner of the Daily Mail, the Daily Mirror and The Times, and a leading exponent of imperialistic jingoism. Harold Harmsworth (1868-1940), Viscount Rothermere, his younger brother, was more interested in the financial than the editorial side of the newspapers. He founded the Glasgow Daily Record in 1910; and controlled Associated Newspapers after Northcliffe’s death. Described as a shy man, in the 1920s and 1930s he greatly admired Mussolini and Hitler. On the substantial Lithuanian community that had settled in Lanarkshire in the latter part of the nineteenth century, see T.C. Smout, A Century of the Scottish People 1830-1950 (Edinburgh, 1986), p. 248. Roland G. Usher, Pan-Germanism (London and Boston, 1913) and Challenge of the Future: a study of American foreign policy (London and Boston, 1916). Also the author of Pan-Americanism: a forecast of the inevitable clash between the United States and Europe’s victor (London, 1915). Here, and in articles and a pamphlet on The Coming War with America (c. 1919), Maclean seems to be reworking some of Usher’s analyses and speculations on a Marxist footing. In the early 1920s, Trotsky and others were to write about the way the growing contradictions between Europe and America threatened a new world war. Emily Hobhouse (1860-1926). Cornish-born philanthropist and moderate women’s-rights campaigner, whose many causes included the welfare of Cornish miners who had emigrated to the USA; child labour; the horrendous mistreatment of Boer women and children in the South African wars; the international women’s movement for peace during World War I; and the conditions of detained refugees and prisoners of war. It is presumably her work on this that Maclean was particularly aware of. The section of the speech devoted to prison conditions and the charge by Maclean that his food had been poisoned was sometimes cited as evidence of ‘paranoia’ and then conflated by political opponents with various unrelated episodes from the latter years of Maclean’s life to create an impression of growing instability. Arguments of this sort served a turn for Communist Party members seeking non-political explanations for Maclean’s refusal to join, and differences with, the CPGB. See, for example, Tom Bell, John Maclean: Fighter for Freedom (Glasgow, 1944) and William Gallacher, Revolt on the Clyde (London, 4th ed., 1978; first published 1936). An article by G. Rubin in the Journal of the Scottish Labour History Society, no. 14 (1980) examines the prison food issue more seriously. There is certainly no question that Maclean’s experiences in prison, both in 1916-17, and after the 1918 trial, enormously damaged his health: see Nan Milton, John Maclean (London, 1973), pp 126-28, and 182; and – by someone who met Maclean after his incarceration – Dora Montefiore, From a Victorian to a Modern (London, 1927), p. 201. The Russian revolution was a beacon of hope for socialists of Maclean’s generation. Good places to start reading about it are Rex Wade, The Russian Revolution, 1917 (Cambridge, 2005); Christopher Read, From Tsar to Soviets: the Russian people and their revolution, 1917-21 (London, 1996) or S. A. Smith, The Russian revolution: a very short introduction (Oxford, 2002). As well as Maclean, prominent supporters of the revolution from the British isles included the journalists Morgan Phillips Price (see M. P. Price, Dispatches from the Revolution: Russia 1916-18 (London, 1997)) and Arthur Ransome, whose book Six Weeks in Russia is available on line here. The Scotsman, 4 May, 1918. Maclean’s references to the Highland clearances give his speech, and his self-perception of the historical role he was playing, added significance. The sweeping nineteenth-century ‘clearances’ of men and women from the great Highland estates, undoubtedly played – along with Irish immigration, especially after the great famine of the 1840s – a role in determining the subsequent bitterness and episodic militancy of the Scottish working class. Maclean must have found Marx’s lengthy section on the Clearances in his analysis of the ‘primitive accumulation’ of capital particularly powerful: see Karl Marx, Capital vol I, chap. XXVII. The Franco-Prussian (German) War, 1870-71. Decisive victory for Prussia in this conflict led to the establishment of the German nation on the basis of its pre-1914 frontiers, including Alsace-Lorraine, the annexation of which was a source of ongoing humiliation for the French. It was the capitulation of the French bourgeoisie in 1871 that led to the defence of Paris passing to the, the Paris Commune, of March-May 1871, seen by the Bolsheviks (and Maclean) as the first workers’government. 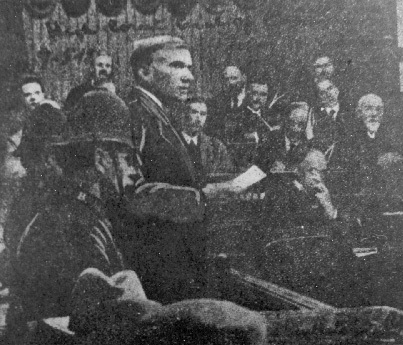 For the development of Maclean’s ideas on this theme, see John Maclean, The War After the War in the Light of Working Class Economics (Glasgow 1918).